The Polynesian conviviality testifies of the “joie de vivre” in these islands, and this conviviality implies the the art of the table. 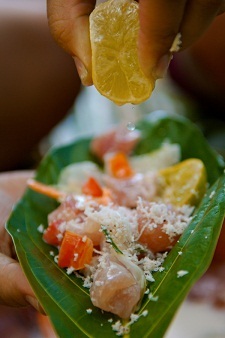 Polynesians are gourmets for whom everything deserves to be celebrated by a good “ma’a” (meal). Every event is an occasion to cook and to savour various dishes born from the diversity of the culinary cultures in our islands. Great feasts to enjoy in family, with friends, or with your beloved one ! 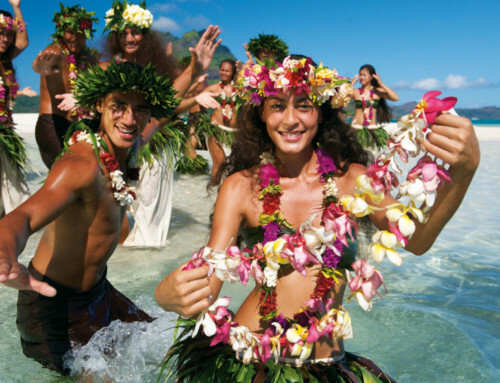 Genuinely a must-do during your stay in Polynesia, the “Roulottes” are located almost everywhere in our islands. 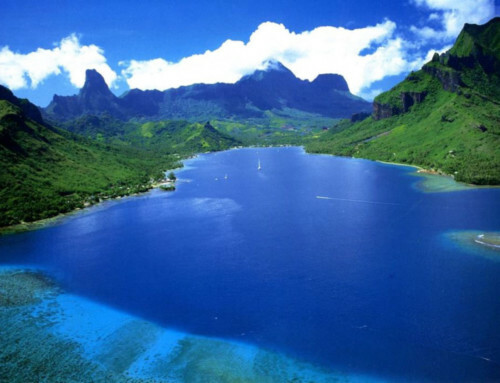 The two main spots in Tahiti are at Vaiete Place – located in Papeete, and at Ta’aone Place – in Pirae. Chao Men will certainly be the second dish on the Best Of list. 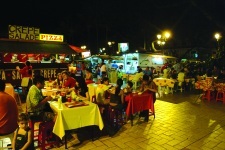 It is also possible to have fresh roasted fish, pizza, salads, vegetables. Everyone will find the perfect dish. This friendly snack bar located in Mahina has a very varied midday and evening menu which is based on fresh fish caught in the lagoons and/or offshore, and served raw as well as grilled. The manageress, Gloria – a Polynesian woman who has lived in the United States of America knows how to combine Polynesian and American delicacies which make the Marukafé an essential address on the East coast. 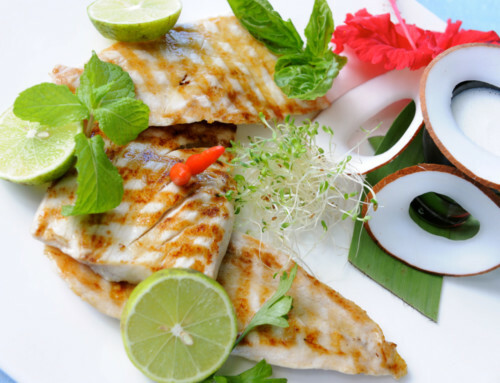 You will be able to taste there the famous raw fish dish in its coconut milk, sashimi, Carpaccio, tartars, duos or trios of fish which will delight your taste buds as will the meat dishes and the desserts. The dishes there are copious, the staff is very helpful and the surroundings are pleasant thanks to the typical Polynesian setting. Do not forget to reserve ! In Taha’a, a trip to “Louise’s” is a must-do. She has been serving the best meals on the island for more than 13 years. Louise is a very friendly and jovial woman. She will make your experience a unique one. Seafood is the house speciality, but of course she would be more than happy to whip something else up if you are allergic. 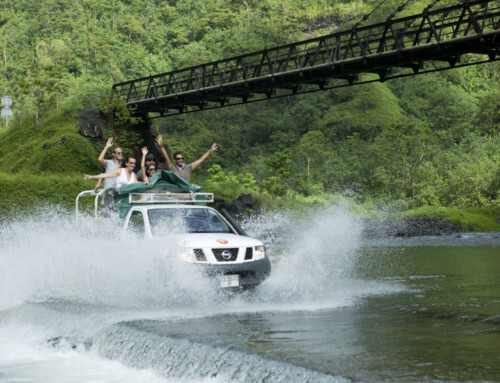 Everything is “home-made”, this lagoon experience is for families and is authentically Polynesian. It is Bill Gates favourite place to eat in Taha’a ! Facing the island of Bora Bora, order “the Marina menu” which includes a half lobster, curry shrimps, and a choice of grilled fish or crab, served with Tahitian-style raw fish and rice. It is guaranteed, you will not regret it! 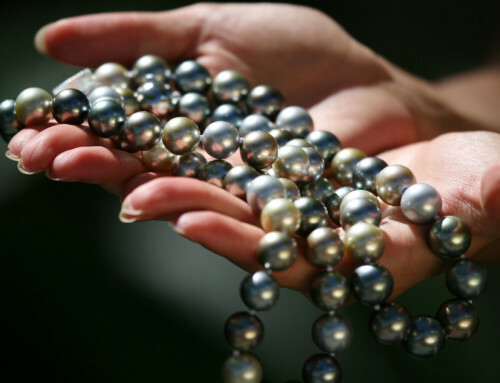 Wherever you are staying in Huahine, Te Marara will be always be recommended. 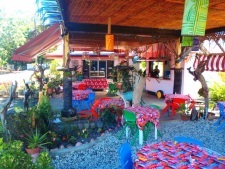 With its great reputation from both the island’s inhabitants and its visitors, the New Te Marara serves grills, salads, French and Chinese dishes, all in an open and kind atmosphere which reflects the people of Huahine. Kiki and her team will be happy to welcome you for lunch (11am to 14pm) and/or dinner (of 6pm til 9pm). It is recommended to reserve in advance. The house speciality is fried Mahi Mahi with coconut pulp. Everyone says how good it is ! The last place to visit on the East coast of Bora Bora is certainly the Maikai Marina & Yacht Club. As it has just moved to the old site of the Top Dive restaurant, the Maikai Marina & Yacht Club is the perfect place to meet the locals in a relaxing place. 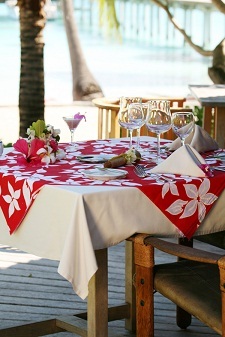 Either for a drink, lunch, or dinner, you now know the place to go in Bora Bora. It is said that for breakfast we must eat like a king, something which Polynesians understood a long time ago. The Tahitian breakfast brings together an incredible range of colours and flavours. Then comes a whole range of local fritters made from flour and coconut milk called Firi Firi, of cakes made from local fruit (bananas, coconut, pineapple), fruit jams vanilla scented, without forgetting the good old baguette which is obligatory with all meals. 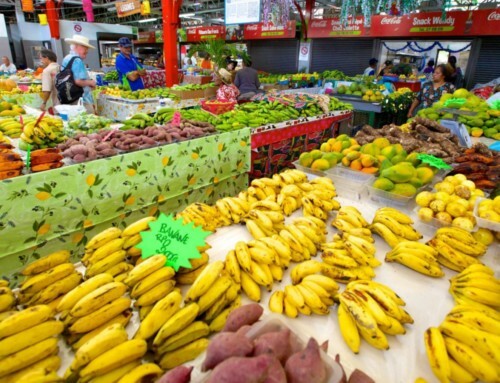 Platters full of local fruit like bananas, papayas, pineapple, grapefruits, and mangoes; and fruit juices are also available. As if it was not enough, breakfast wouldn’t be Polynesian without the famous “pu’a rôti ” (roast pork); and fried fish.